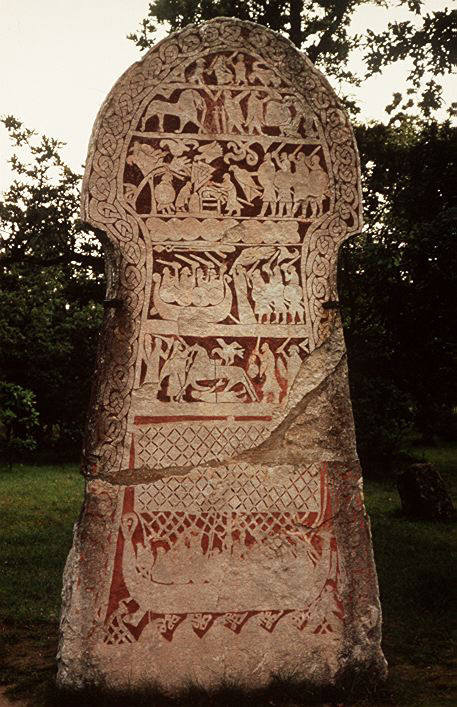 A section from the Stora Hammar stone from Gotland, Sweden. The illustration shows a man lying on his belly with another man using a weapon on his back. There is a Valknut above him, and two eagles, one of which is held by a man to the right. The Blood Eagle was a method of torture and execution that is sometimes mentioned in Norse saga literature. It was performed by cutting the ribs of the victim by the spine, breaking the ribs so they resembled blood-stained wings, and pulling the lungs out. Salt was sprinkled in the wounds. Victims of the method of execution, as mentioned in skaldic poetry and the Norse sagas, are believed to have included King Ælla (Ella) of Northumbria, Halfdan son of King Haraldr Hárfagri of Norway, King Edmund, King Maelgualai of Munster, and possibly Archbishop Ælfheah. The historicity of the practice is disputed. Some take it as historical evidence of atrocities fueled by "pagan hatred for Christianity", while others take it for fiction inspired by heroic Icelandic sagas, skaldic poetry and inaccurate translation. Alfred Smyth (1977) is a particularly enthusiastic supporter, taking the blood-eagle rite as a historical practice of human sacrifice to the Norse god Odin. There are a number of accounts of the practice in Norse sources. The Orkneyinga saga : "Next morning when it was light they went to look for runagate men among the isles if any had got away; and each was slain on the spot as he stood. Then earl Torf-Einarr took to saying these words: 'I know not what I see in Rinansey, sometimes it lifts itself up, but sometimes it lays itself down, that is either a bird or a man, and we will go to it.' There they found Halfdan Long-leg, and Einar made them carve an eagle on his back with a sword, and cut the ribs all from the backbone, and draw the lungs there out, and gave him to Odin for the victory he had won (10) then Einar sung this:"
Her for se here of East Englum ofer Humbre muþan to Eoforwicceastre on Norþhymbre, ⁚ þær wæs micel ungeþuærnes þære þeode betweox him selfum, ⁚ hie hæfdun hiera cyning aworpenne Osbryht, ⁚ ungecyndne cyning underfengon Ællan; ⁚ hie late on geare to þam gecirdon þæt hie wiþ þone here winnende wærun, ⁚ hie þeah micle fierd gegadrodon, ⁚ þone here sohton æt Eoforwicceastre, ⁚ on þa ceastre bræcon, ⁚ hie sume inne wurdon, ⁚ þær was ungemetlic wæl geslægen Norþanhymbra, sume binnan, sume butan; ⁚ þa cyningas begen ofslægene, ⁚ sio laf wiþ þone here friþ nam; ⁚ þy ilcan geare gefor Ealchstan biscep, ⁚ he hæfde þæt bisceprice .l. wintra æt Scireburnan, ⁚ his lic liþ þær on tune. Here the Viking enemy army went forth from East Anglia over the mouth of the Humber to York town in Northumbria, and there was there great discord of the people among themselves, and they had their king Osberht overthrown, and accepted a strange king Ælla; and they late in the year turned to fighting against the enemy army, and they gathered a great army, and they sought the enemy army at York, and broke into the town, and some of them got in, and there was an unmeasurable slaughter of Northumbrians, some inside, some outside; and both kings were slain, and the survivors made peace with the enemy army; and in the same year bishop Ealhstān died, who had the bishopric 50 winters at Sherborne, and his body lies in the town. Finally, some believe the blood eagle is referred to by the 11th-century poet Sigvatr Þórðarson, who, some time between 1020 and 1038, wrote a skaldic verse named Knútsdrápa that recounts and establishes Ivarr the Boneless as having killed Ella and subsequently carving an eagle onto his back. Skaldic poetry, a common medium of Norse poets, was intentionally meant to be cryptic and allusive, therefore the idiomatic nature of Sighvatr's skaldic verse, describing what has become known as the blood eagle, is a matter of historical contention. This is all the truer in this case, since, in Norse imagery, the eagle was strongly associated with blood and death. Roberta Frank writes in her article "Viking Atrocity and Skaldic Verse: The Rite of the Blood-Eagle", "By the beginning of the nineteenth century, the various saga motifs - eagle sketch, rib division, lung surgery, and 'saline stimulant' - were combined in inventive sequences designed for maximum horror." (p. 334) She concludes that, reveling in the misdeeds of their pagan predecessors, the saga authors took skaldic poetry originally intended to make elliptical reference to defeat in battle (causing one's back to be scored by eagles, i.e. killing them and thus turning them into carrion) along with separate martyrdom tracts expressing the final tortures of worthy victims in terms reflective of the intended execution of Saint Sebastian (shot so full of arrows that their ribs and internal organs were exposed) and combined and elaborated them into a grandiose torture and death ritual that never was. If the procedure were performed, the condemned would die of suffocation very soon after the lungs were pulled out (since breathing occurs via the diaphragm and chest muscles) and would probably lose consciousness due to blood loss and shock before that. Thomas Harris mentions the blood eagle in his novel Hannibal. When Hannibal Lecter arrives back in the United States, he murders his 27th victim, a deer hunter, and arranges the corpse like the blood eagle. R.A. MacAvoy portrays a blood eagle performed on a sacrificial victim in the fantasy novel Book of Kells. Alan Moore mentions the blood eagle in his novel Voice of the Fire, in the chapter entitled "November Saints". The blood eagle also appears in Edward Rutherfurd's novel Sarum. Annie Dillard's novel The Living includes the blood eagle. Craig Russell has written a detective novel, Blood Eagle, set in modern-day Hamburg involving a serial killer who murders his victims in the style of the blood eagle. The Night Lords Chaos Space Marines are known to tear open their POW's rib cages and crucify them to their tanks, as described in the Warhammer 40,000 novel Nighbringer by Graham McNeill. In the historical novel Conscience of the King by Alfred Duggan, the main character, Cerdic, relates how Gertrude, sister of King Oisc of Kent, became pregnant, which infuriated Oisc because of the potential threat to his own line. She was consequently branded with the blood eagle. Harry Harrison's Hammer and Cross series has at least one character killed by this means. Guy Gavriel Kay mentions the blood eagle in The Last Light of the Sun. There is a historical scene within Neil Gaiman's novel American Gods, in which several Norse warriors who travel to America seize a Native American brave and perform the blood eagle upon him to mark their passage into the New World. There is a reference to this practice on the website for the film Pathfinder. In the horror film Saw III, Detective Kerry is killed in a trap similar to the blood eagle. The fantasy novel Northern Lights mentions creatures called the "Breathless Ones", who are essentially living-dead victims of the blood eagle. In the crime fiction The Tunnels by Michelle Gagnon, at least two of the victims found had the blood eagle performed upon them. In the fantasy novel When Death Birds Fly by Andrew J. Offut and Keith Taylor, writing a continuation of Robert E. Howard's Cormac Mac Art character, the blood eagle is used at the end on the main antagonist. David Gibbins mentions the blood eagle extensively in his book Crusader Gold in reference to Halfdan, son of King Haraldr Hárfagri of Norway. Also, one of the book's characters has the blood eagle performed on him. Stephen Baxter mentions the blood eagle in his science fiction book Conqueror several times, including a detailed description of the ritual. Mercedes Lackey mentions the ritual in her novel Burning Water. In it, the protagonist Diana Tregarde describes it as the act of slicing the victim's back between the ribs and then pulling out the lungs through the slits. The victim is then left to die over a period of "usually hours to days." The character of Starkad in Robert Low's The Wolf Sea is killed by means of the blood eagle. Robert E. Howard mentions the blood eagle in some of his stories dealing with the character Cormac Mac Art. Italian epic doom metal band Doomsword have a song entitled "Blood Eagle" on the Let Battle Commence album. This song is about King Ælla's death. There is a song entitled "Bloode Eagle" by the German metal band Stormwarrior. "The blade awaits thee/thy back shalle be slit/The bloode-dripping lobe of thy lunges/Builde a pair of wings/Delivered to Odinn..."
In J.D. Rhoades's crime fiction novel Breaking Cover, the leader of a biker gang orders two people killed using the blood eagle, which he read about in prison. In Fox's Bones (TV series), a forensic television show, in the episode "Mayhem on a Cross", the team discovers a body which was treated to this "Blood Eagle" torture technique. In the title story of Wells Tower's Everything Ravaged, Everything Burned collection, Tower describes the performance of the blood eagle by a band of marauding Vikings. The black metal/grindcore band Anaal Nathrakh has a song titled "Blood Eagles Carved on the Backs of Innocents" which appears on the album In the Constellation of the Black Widow. ^ Patrick J. Smith, Violence, Society and Communication: the Vikings and Pattern of Violence in England and Ireland 793-860, p. 17; Smyth, A.P, Scandinavian Kings in the British Isles, 850-880 (1977), Oxford. Roberta Frank. "Viking Atrocity and Skaldic Verse: The Rite of the Blood-Eagle". The English Historical Review. Vol. 99, No. 391, Apr. 1984.